CHICAGO - U.S. Products - January 29th, 2014 — For decades, facility managers and owners have pondered the health benefits or detriments of installing carpeting, but recent studies are swaying the argument in favor of carpeting. Each year approximately 100,000 people in the U.S. die due to hospital-acquired infections (HAIs), according to the U.S. Centers for Disease Control and Prevention (CDC). This is often greater than the number of people who die annually from AIDS, breast cancer and automobile accidents combined. This astoundingly high number has remained at this level for years even though many medical facilities have taken steps to reduce it. However, one surprising way medical administrators may be able to reduce the number of deaths may be right under their feet: carpeting. 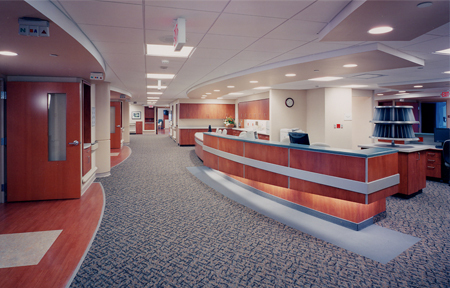 For instance, a recent study conducted by Airmid Healthgoup Limited, a leading biomedical research organization, found that properly maintained carpets (using high performance vacuum cleaners and cleaned using hot water extractors) can trap foreign allergens that could have potential negative health impacts and improved overall air quality far greater than hard surface flooring. This follows a 2008 study, "Carpet, Asthma and Allergies — Myth or Reality," by Dr. Mitchell W. Sauerhoff, that found carpeting has the ability to hold and trap (sequester) contaminants, a feature not possible with hard-surface floors. "We can have as many as 50 direct and indirect contacts with floors every day," says Joe Versluis, national sales manager for U.S. Products, a leading manufacturer of hot-water carpet extractors. "If contaminated floors are touched and then we touch other surfaces, this begins cross contamination and the way disease and infections can spread." "This is not a surprising result," according to Sauerhoff, "since one of the properties of carpet is that it ... [traps and holds] biomaterials that would otherwise be resuspended into the breathing zone." "Hopefully, medical administrators will revisit these studies to help reduce the staggering number of HAIs in this country," suggests Versluis.